Life is ironic and unpredictable. For the last two months, our workplace have proud parents that welcome two newborn babies into this world... Unexpectedly, one of the parents died in our workplace due to a sudden heart attack. This child's father is a charming man in his early-thirties and sadly, the poor child didn't even have a chance to say a word to his talented father. I was shocked returning to work with this sad news. I felt very sorry for his colleague's wife, children, parents and family. Although my colleague's departure is heartbreaking, I have slowly accept the truth and learned to move on. Life is unpredictable. Sometimes happy or sad. Sometimes good or bad. Most importantly to me... I'm learning to cherish and love every thing and moment that I have. Now, back to one of my usual happiness... BAKING! I remember when I first received the book, Williams-Sonoma baking book, I was feeling extremely excited too, browsing all the recipes in this very-thick baking book. Every bake in this book looks so heavenly delicious! As much I like to relate the taste of these bakes with their looks, I like to know which specific recipes are highly reviewed. To know that, I have checked out the ratings and reviews of a few particular recipes at Williams-Sonoma Recipe website. 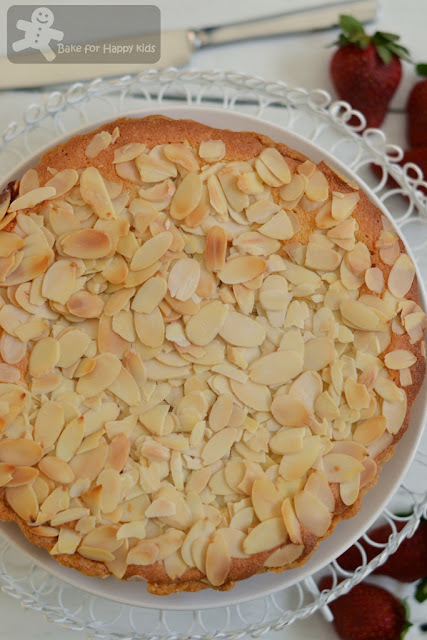 This Italian almond tart that I choose for our bake-along with Joyce from Kitchen Flavours and Lena from Frozen wings, is amongst the list of Williams-Sonoma recipes that I have researched and found to be highly reviewed. If you are thinking of baking this tart... Please do it! Please don't be put off by the use of almond paste mentioned in this recipe, thinking that this ingredient might be not available in the place you live. For this bake, I have made my own almond paste in order to illustrate that homemade almond paste works well for this recipe too. The almond paste that I used for this recipe from Food.com is pretty straightforward, containing only three ingredients. Trust me... kneading and yielding a smooth almond paste is extremely easy and can be quite a therapeutic and satisfying thing to do - LOL! If I'm a super-critical perfectionist, the only thing that I would complain is... the jam that I used!!! For this bake, I took a short cut by using store-bought jam and regretted a lot for not making any strawberry jam from scratch. Sadly, I would say that the sweetness of this tart minus the jam layer is close enough to my definition of perfection, having this store-bought strawberry jam was resulting the tart a little too sweet for our taste. If I would re-wind this baking... 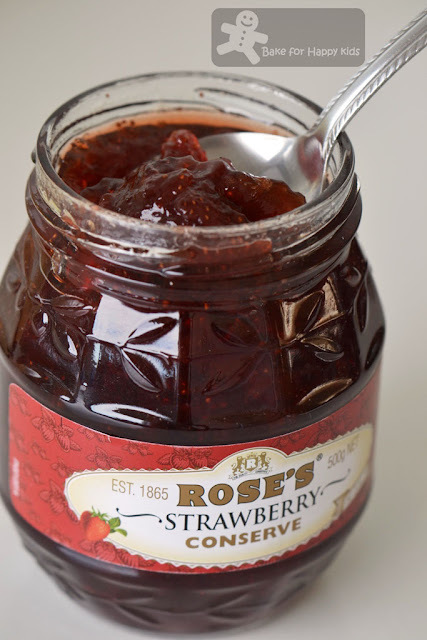 I will either (1) use homemade strawberry jam like this one that I have previously made before or (2) use lesser jam or (3) use sugar-reduced / diabetic-friendly jam. Having said that, I'm still rating this bake 5 out of 5!!! 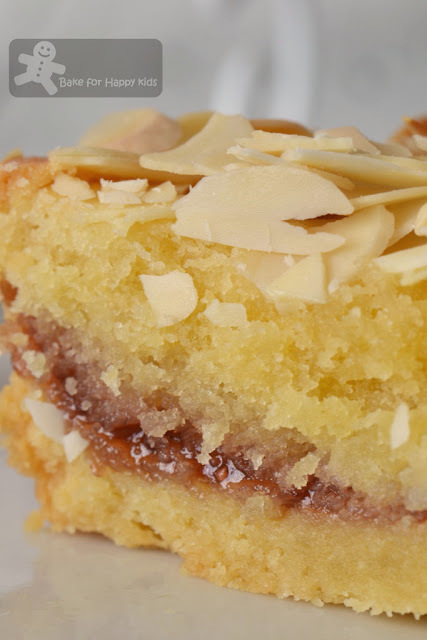 I like to rate this Italian almond tart a 5 out 5! Eureka! - I made my own almond paste!!! - LOL! This pastry can be too soft for handling. Make sure that it is well-chilled before rolling. And, make sure that the tart shells are well-chilled too before baking. ... with this and this... Ta Dah! Or maybe I was fitting in too much almond filling into these two small tarts??? Can't wait to try this... A very fragrant almond tart freshly baked from my oven! I was like... "WOW!" when I cut a slice of this! The very moist almond filling with slight macaron-chewy texture is extremely yummy! Transfer the dough to a work surface, pat into a ball and flatten into a disk. Use the dough immediately, or wrap in plastic wrap and refrigerate until well chilled, about 30 mins. To roll out the dough, on a lightly floured board (or in between two baking sheets), flatten the disk with 6 to 8 gentle taps of the rolling pin. Lift the dough and give it a quarter turn. Lightly dust the top of the dough or the rolling pin with flour as needed, then roll out until the dough is about 1/8 inch thick. Use a small, sharp knife to cut out a round or rounds 2 inches greater in diameter than your tart or larger tartlet pans. Use a small, sharp knife or a cookie cutter to cut out rounds 1/2 to 1 inch greater in diameter than your miniature tartlet pans. If using a rectangular tart pan, cut out a rectangle 2 inches larger on all sides than the pan. Nut dough variation: Add 2 tbsp ground toasted pecans, walnuts, almonds or hazelnuts to the flour mixture and proceed as directed - I have added 2 tbsp ground almond into my tart dough. Note: I have made my tart dough by hand. Using the full amount of the recipe, I have made one medium-sized tart shell using one 19 cm loose bottom round tart pan and two small tarts shells using 11 cm loose bottom round tart pans. Fold the dough round in half and carefully transfer to a 9 1/2-inch tart pan (or 1 x 19 cm plus 2 x 11 cm round pans), preferably with a removable bottom. Unfold and ease the round into the pan, without stretching it, and pat it firmly into the bottom and up the sides of the pan. 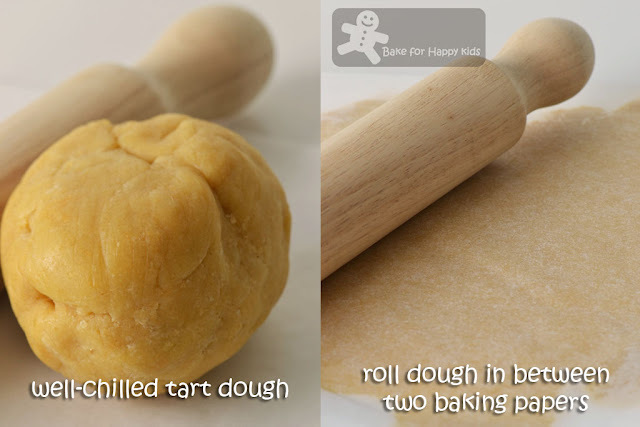 Trim off any excess dough by gently running a rolling pin across the top of the pan. Press the dough into the sides to extend it slightly above the rim to offset any shrinkage during baking. Refrigerate or freeze the tart shell until firm, about 30 mins. Meanwhile, position a rack in the lower third of an oven and preheat to 375°F (or 170°C fan forced). 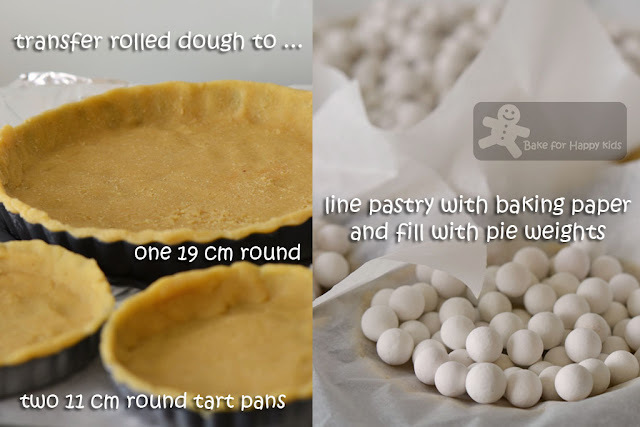 Line the pastry shell with aluminum foil or parchment paper and fill with pie weights or raw short-grain rice. Bake for 20 mins, then lift an edge of the foil. If the dough looks wet, continue to bake, checking every 5 mins, until the dough is pale gold, for a total baking time of 25 to 30 mins. Transfer to a wire rack. Position a rack in the middle of the oven and reduce the heat to 350°F (or 160°C fan forced). 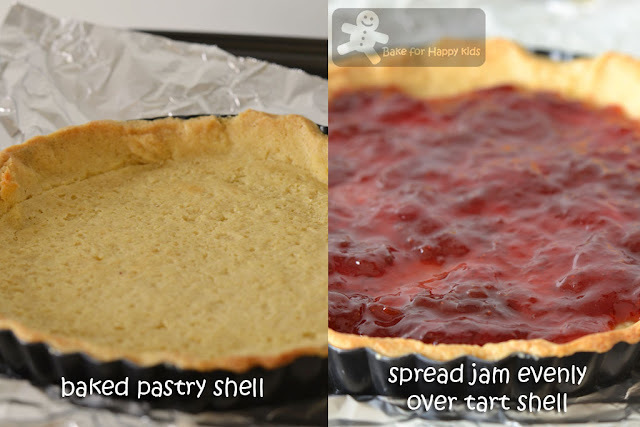 Spread the jam evenly over the bottom of the partially baked tart shell. Spoon in the almond paste mixture and spread evenly over the jam. 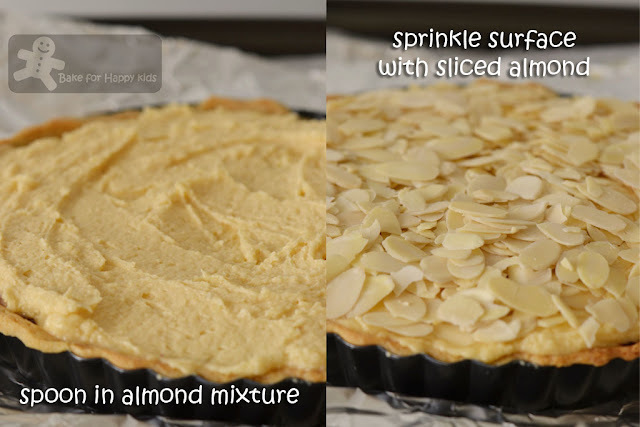 Sprinkle the surface evenly with the sliced almonds (I did this only for the 19 cm round tart). Bake the tart until the filling is golden and the middle is firm to the touch, 35 to 45 mins. Transfer to a wire rack and let the tart cool completely. If using a tart pan with a removable bottom, let the sides fall away, then slide the tart onto a serving plate. Serve at room temperature. Note: Using full amount of the recipe, I have made one medium-sized tart using 19 cm loose bottom round tart pan and two small tarts using 11 cm loose bottom round tart pans. The tarts shells were baked at 170°C fan forced for 25 mins (small) and 30 mins (medium). 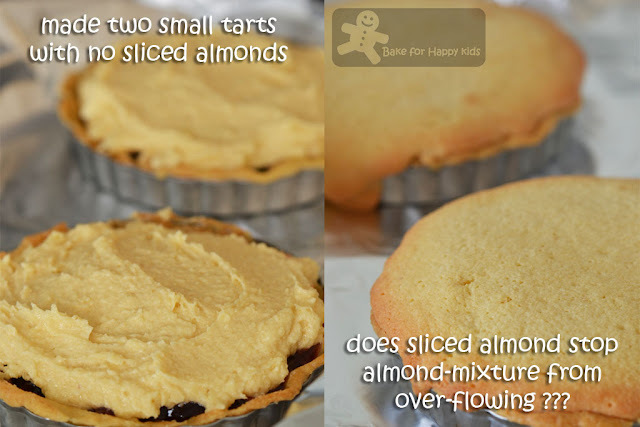 With almond fillings, the tarts were baked at 160°C fan forced for 35 mins (small) and 50 mins (medium). Grind your almonds. In the second grind, add the sugar. Instead of using whole almond and grinding them, I used almond meal which is almond ground for me in a packet. I mixed both almond meal and icing sugar together and sift them three times. Gradually add your egg white, working the mixture vigorously using a dough hook in mixer or knead by hand on a pastry board. - I did mine by hand. The mixture should be firm and smooth when ready. Note: Using half amount of this recipe, I have made 250g almond paste to bake the full amount of the above Italian almond tart recipe. So sorry to hear such sad news Zoe. Life is so unpredictable. Wow. Looks really easy to do but I'm not sure if I can pull it off. I'm constantly looking for easy to do recipes for my 2-yr old. :) Thank you for following my blog. I'm following back! Zoe, thank for introducing me to Williams-Sonoma! I love almonds, but not a fan of the paste tho. Nonetheless, I won't mind having a slice of your bake! Oh, what a fantastic looking tart. 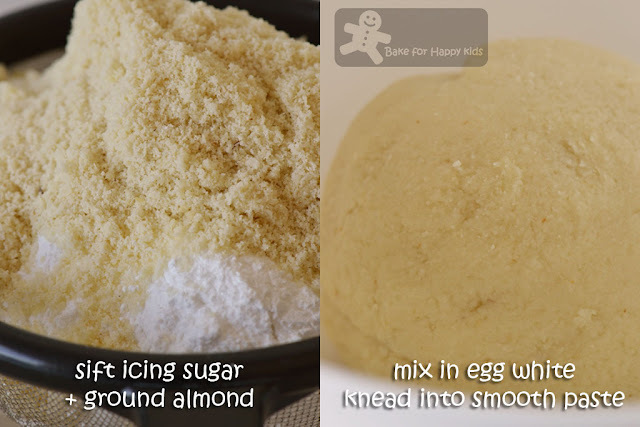 I love anything using almond flour! Happy to have you back with your fabulous bakes. I was hesitating whether to bake this or not when I saw the ingredient almond paste. I use to bought this almond paste from Brunei but if I am not going then I can't get it here. 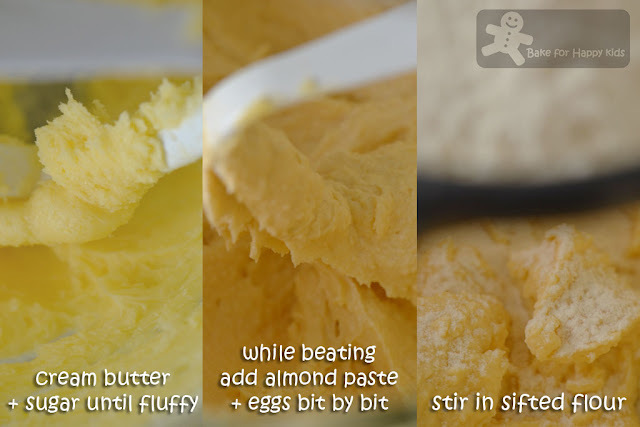 Thank you so much for sharing the DIY of almond paste. I am going to back this soon. Your pie looks heavenly delicious. Love it!! Sorry to hear about your colleague. Hope his family is coping well in this difficult time. As for the almond tart, I really like it, and yes, the filling goes well with tart and slightly tangy jam. I used my homemade mulberry jam which is a little tart, since I use less sugar, and it blends perfectly well with the filling. Thanks for a great pick. I like almond & tart ! Lovely ! This tart smell heavenly when baking in oven. It seems we all love it! I'm so sorry to hear about your colleague, that is so sad and heartbreaking for his loved ones. It definitely makes us cherish our loved ones when we hear about these sad passing. I don't even know that family and my heart is breaking. I hope your colleague's wife is able to find the strength she needs at this time. And who doesn't love generous heapings of jam! I am sorry to read about your colleague's sudden departure. My thoughts are with his baby and family. Indeed, Zoe! Since you were gone, I only renew my blog once a week, suddenly want to slow down in blogging. And also I have baked less, not enough recipes to update. 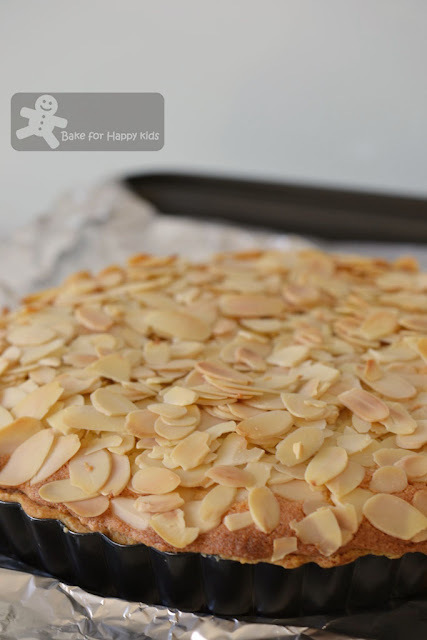 Are you sure you have enough flaked almonds for your delicious-looking tart, hahaha! I love seeing the tart fully recovered with so much of flaked almonds. Crunch crunch crunch! I also 'Wowed' when i reached the picture that you 'Wowed' at :) That tart sure looks good! Hi Zoe, it does sounds very delicious, your photos are very tempting! I am cutting down of baking too, better save some energy for the coming festive seasons lol! Zoe, your tart looks so very good! I have been visiting and looking at the other tarts and I really should give it a go. Tarts and pies and other forms of pastry (which I love to eat) is unfamiliar territory to me and I am slow to catch on. 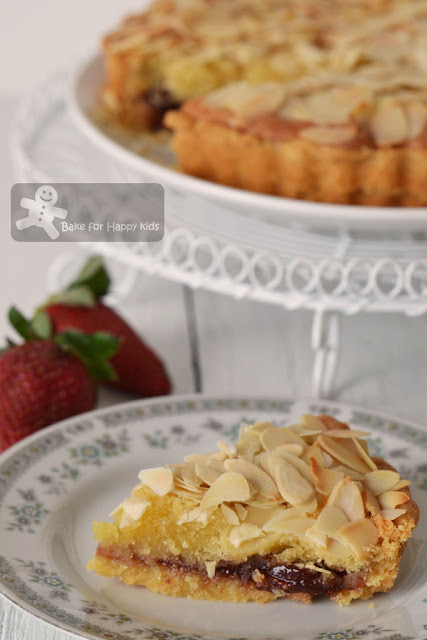 After checking out all your almond tarts, I think i need to make my own! It's a great tart - one that makes us enjoy life and enjoy the company of our loved ones while we have the chance. Thank you so much for sharing.